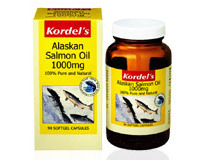 Kordel’s Alaskan Salmon Oil contains omega 3 fatty acids. Omega 3 fatty acids are essential nutrients needed by humans as part of the body’s metabolic processes and cannot be synthesised in the body. They must therefore be obtained from the diet or supplements..
Kordel’s Alaskan Salmon Oil provides omega 3 fatty acids - eicosapentaenoic acid (EPA) and docosahexaenoic acid (DHA). 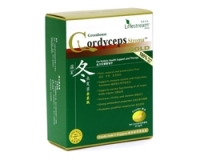 They are used by the body for the synthesis of prostaglandins, a group of compounds needed for good health. They control many of the body’s essential functions which affect blood circulation, skin and inflammation. Omega 3 fatty acids are heart-friendly nutrients. They can prevent blood platelets from clotting and sticking to artery walls thus reducing the risk of blocked blood vessels and heart attacks. Omega 3 fatty acids lower triglycerides, bad and total cholesterol, and modestly reduce blood pressure. Omega 3 fatty acids are converted into prostaglandin E3 (PGE3) in the body. PGE3 is a hormone-like compound that has anti–inflammatory action. Research has supported the use of omega 3 fatty acids in reducing inflammation in osteoarthritis and rheumatoid arthritis. Omega-3s are known to have membrane-enhancing capabilities in brain cells. Omega 3 fatty acids are important to keep the brain and nervous system functioning normally. Reduced omega 3 fatty acids in the body tissue have been associated with memory impairment, depression and some neuropsychiatric disorders. Studies have shown that fish oil supplementation may be of benefit in dementia, depression, autism and schizophrenia. Recent research has shown that a higher intake of omega 3 fatty acids may reduce the risk of age-related macular degeneration (AMD). AMD is a disease associated with aging that gradually destroys sharp, central vision. Omega 3 fatty acid, and particularly DHA plays an important role in the layer of the nerve cells in the retina, thus a diet rich in omega 3 fatty acids can help reduce the risk of AMD. Omega 3 fatty acids can also prevent dry eye syndrome (DES), as omega 3 is able to reduce the inflammation of the tear glands, and the surface of the eye that has been associated with DES. DES is a problem where there is an insufficient amount of tears to moisten the front surface of the eye. Kordel’s Alaskan Salmon Oil is extracted from wild sockeye salmon, providing the cleanest uncontaminated pure salmon oil. Wild sockeye salmon also contains the highest amount of natural antaxanthin, a potent antioxidant that protects the body from free radicals. Each batch of product undergoes stringent testing for freshness and the presence of environmental contaminants including mercury, PCBs (polychlorinated biphenyls), DDT (an organic pesticide) and dioxins. Take 1 capsule 1 – 3 times daily, with or after meals, or as directed by a healthcare professional.